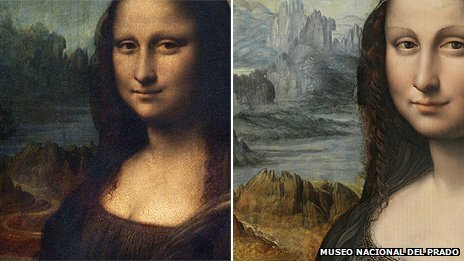 A painting thought to be the earliest replica of Leonardo Da Vinci’s Mona Lisa has been discovered at Madrid’s Prado Museum. The Prado said it did not realise its significance until a recent restoration revealed hidden layers. The artwork features the same female figure, but had been covered over with black paint and varnish. 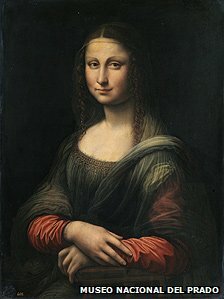 The painting is thought to have been created by one of Leonardo’s students alongside the 16th century original. There are dozens of surviving Mona Lisa replicas from the 16th and 17th centuries. The Art Newspaper, which reported the discovery, said the “sensational find will transform our understanding of the world’s most famous picture”. The original painting, which currently hangs at the Louvre in Paris, is obscured by several layers of old, cracked varnish. However, cleaning and restoration is thought to be too risky because the painting is fragile. The Art Newspaper said the removal of the black paint on the replica had revealed “the fine details of the delicate Tuscan landscape”, which mirrors the background of Leonardo’s masterpiece.